through ncbaptist.org, scbaptist.org, SBDR.org/hurricanerelief or through the MBA. The MBA is collecting gift cards and funds to deliver to SBC command centers on the front lines. Please remember faith-based organizations are better equipped to meet spiritual needs and provide emotional comfort than secular response teams. • Funds to the state convention or association on the front lines of the disaster. MBA DR can take your donation at the MBA and will send it to the highest need area. • Gift cards are easy to collect, transport and distribute, a gift card allows the person to get the specific food, clothing, cleaning or repair supplies they need. Lowes, Home Depot and Walmart will be open as soon as generators and facilities are deemed safe. Fast food options will be welcome if they have been eating from feeding units. • If you have contact with a specific church, with a specific needs list, then load up a box truck and take it to that specific location. Remember the needs change every 3-5 days, so collection and transportation often means arriving with obsolete requests. Remember roads may be closed and crowded for an extended time. Everything you take will need to be unloaded, stored and distributed, taking volunteers from other essential tasks. • Remember trained volunteers with credentials will have access prior to untrained volunteers. • Secular response options are not equipped to meet spiritual needs among hurting people. Sonrise Baptist Church is having a youth rally/concert called Dwell on October 6, 2018 at 7:00 p.m. Youth from all over the Mobile area are invited to join us for this event that will feature multiple music groups and a guest speaker. With music and spoken word, we strive to help our youth Dwell on the message of Christ and not on the worldliness that is prevalent all around us every day. By using Christian music of various styles in a concert type setting, we hope to open the hearts and ears of our youth to hear the spoken word from people who have a genuine heart and message of hope. Please consider this event for your youth group, or at least let them know about it so they can tell their friends. 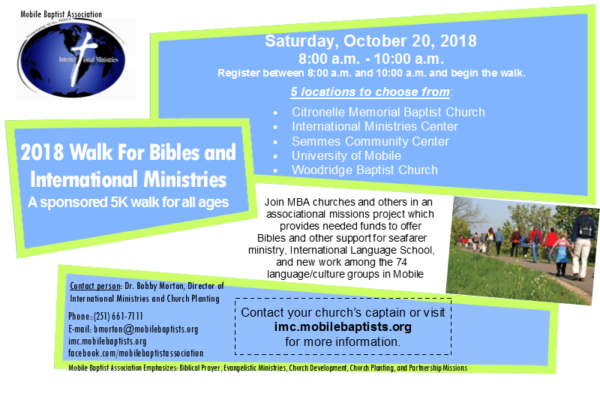 Our hope is that we can reach as many churched and unchurched youth as possible in the Mobile area through an event like this and help them see that there is hope, no matter what they are feeling at the moment. For any addition information, please feel free to check out our webpage at dwell.sonrisebc.net our Facebook page at facebook.com/DwellMinistriesMobile or email Greg Hicks, Media Director, at dwell@sonrisebc.net. EVERY church member is welcome and encouraged to attend; not just messengers. Messengers are the ones who vote on matters that require a vote, but anyone can attend as a visitor. Our moderators and leaders continue to explore ways to make celebrating associational missions as convenient as possible. Please relocate your evening service to join us. The two-hour program will provide an overview of missions work across the county. It can help church leaders understand why cooperative missions is important. 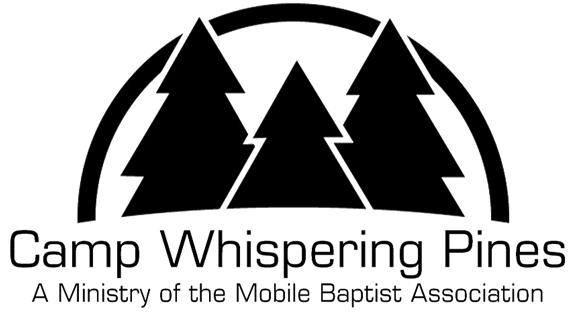 It provides clear testimony for churches to continue financially supporting the work of the MBA. Sunday night provides an opportunity for Mobile Baptists to celebrate missions cooperatively and worship together with a myriad of languages and cultures. Please join us. Kevin Cobb at West Mobile Baptist Church is looking for the accompaniment cd for the Travis Cottrell Christmas cantata called King of Glory King of Love. 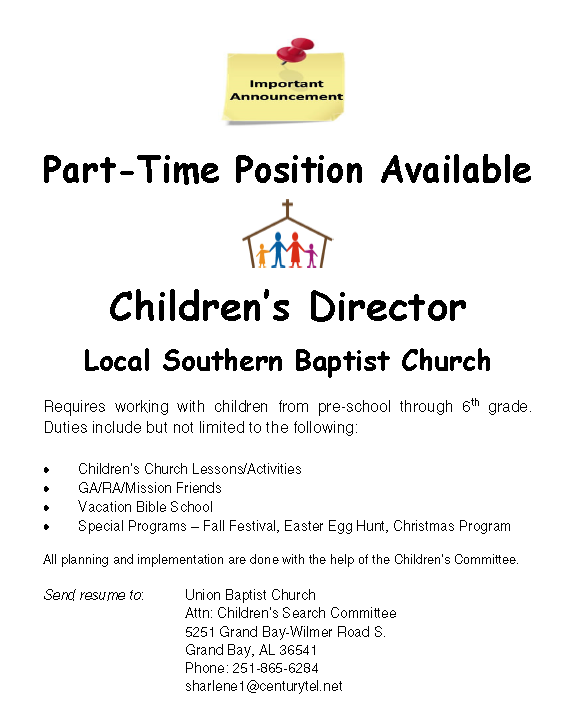 Contact Kevin Cobb at 251.639.9952 or Kevin@wemochurch.org.